Party time with Eddie Chamblee. Eddie Chamblee was born in Atlanta in 1920. He was the featured tenorist on Sonny Thompson’s big hits Long Gone and Late Freight and played in the groups of Lionel Hampton, Cozy Cole, Amos Milburn, T-Bone Walker, Lowell Fulson, Machito and singer Dinah Washington, with whom Chamblee was married for a short period. While leading his own groups, the tenor saxophonist played on r&b and doowop tunes, notably by The Diamonds and The Drifters. The liner notes writer of The Rocking Tenor Sax mentions two funny details. Firstly, Chamblee is the tenor saxophonist that the viewer notices standing beside Brigitte Bardot in Roger Vadim’s movie And God Created Woman. Secondly, Chamblee performed at the Inaugaration Party of President Eisenhower in 1956. If you had to choose between one of these supporting roles, which one would it be? Rejoining Hampton in the eighties, Chamblee was further associated with Milt Buckner and Count Basie. Chamblee passed away in 1999. Prior to his affiliation with Prestige, Chamblee recorded two albums for EmArcy, Chamblee Music and Doodlin’. The Rocking Tenor Sax is Chamblee’s only album as a leader in the sixties. The title is a great reflection of the kind of roaring live gigs one could experience in those days. It isn’t live-in-performance but it feels that way. Obviously, the legendary engineer Rudy van Gelder at work here, beware that no one took notice of his innovative recording methods, rarely invited neighbours, relatives or friends. Would’ve been one hell of a party. Soul jazz grew out of swing, r&b and modern jazz. Generally speaking, it was an Afro-American phenomenon, a type of music that was enjoyed in clubs and bars around the country but particularly popular in the Mid-West. Though there’s no mistaking that most players had a solid background in modern jazz, (by the way, part of the work of giants of jazz like Cannonball Adderley or Sonny Stitt is also categorized as soul jazz – Adderley’s Jive Samba was a big hit) entertainment was key. Soul jazz was, first and foremost, accessible, finger-poppin’, foot-tappin’, hip-shakin’ music for a night out into town. The pioneering, relatively small independent record companies presented a catalogue of blues, ballads, American songbook and popular tunes – groove music. Prestige, Blue Note and Argo/Cadet possessed a good distribution network and carried their stock to radio stations and the jukebox circuit, hoping for a hit record or single. A hit didn’t necessarily have to be an original composition. There are many examples of interpretations of hits by artists which also turned into big sellers. The Honeydripper, the opening cut from Eddie Chamblee’s Prestige album is a case in point. It was a hit for the original writer, Joe Liggins. Soon after, Roosevelt Sykes made a successful version. The take on the contagious r&b melody by Eddie Chamblee didn’t lead to skyrocketing sales. But no doubt, his rousing version blows the roof off the joint. Said Honeydripper has Chamblee climaxing early but not necessarily too soon, if you know what I mean. Chamblee’s got plenty of juice, honking his way through the choruses and the rocking 4/4 bottom that drummer Al Griffin provides. Chamblee alternates growls with screeching high notes, a specialty that Chamblee demonstrates on other tunes on the album as well. There goes Van Gelder’s Delft Blue tableware. 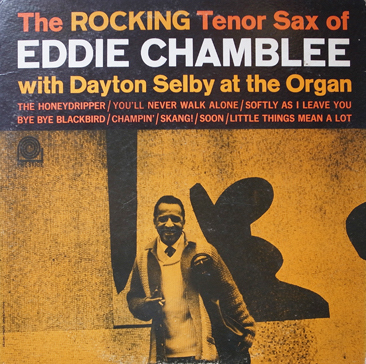 Chamblee shows no signs of fatigue, providing effective swing riffs behind organist Dayton Shelby, who’s quite the musical rebel rouser himself. It’s easy to imagine Chamblee’s trio perform at one of the dingier clubs on The Street. Some colorful cat offers a beauty a drink, the chatter of customers pierces little holes in the cigarette smoke clouds… And Chamblee bounces through his original tunes Champin’ and Skang!, the former a sleazy jump blues, the latter a slow, down-home blues. There’s the hard rock (like, hard rock) of Bye Bye Blackbird, courtesy of the bulldozer drum patterns by Al Griffin. And while Softly As I Leave You is a pretty sapless attempt to balladeer gent and dame into the French Kissin’ zone, embellished by lachrymose organ playing, Soon finds a soft spot in the heart. The Gershwin composition is gracefully marked by Chamblee’s velvet yet peppery lines and beautifully inflected notes. Here Chamblee has reached a synthesis between suppleness and groove. Soon is the highlight of The Rocking Tenor Sax Of Eddie Chamblee, but it can’t hurt to keep the remainder of the repertory in mind for a house party. Satisfaction guaranteed. 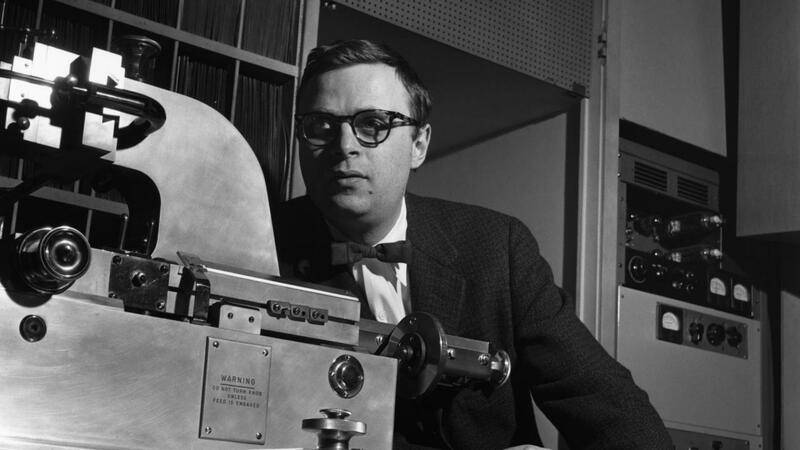 Engineer Rudy van Gelder passed away this week on Thursday, August the 25th. Mr. Van Gelder, not surprisingly, is a trending topic. Already during the pioneering engineer’s lifetime, Van Gelder acquired a mythic status among jazz lovers around the globe. Serious jazz collectors discuss ‘original’ pressings of Van Gelder’s Blue Note albums and the famous ‘ear’ mark in the dead wax on the world wide web on a daily basis. Van Gelder isn’t the only audio legend (For instance, Roy DuNann and Tom Dowd enjoy a dedicated following) but certainly has been the most widely revered in jazz history. Besides his brilliant, revolutionary engineering, RvG’s association with Blue Note is responsible for his status. There was a certain mystique as to how Van Gelder created the label’s poignantly warm, transparent and spacious sound. Occasional criticism – through the overuse of reverb Van Gelder recordings sometimes seem personal soundscapes instead of palettes attuned to the special features of the involved artistic personalities – seems, if justifiable serious audio geek-critique, a bit presumptuous to me in the light of Van Gelder’s countless gifts to the jazz world. It is evident that Rudy van Gelder’s role in shaping modern jazz is everlasting and paramount. Naturally, Van Gelder didn’t work exclusively for Blue Note in his legendary Hackensack and Englewood Cliffs, New Jersey studios, but also for Prestige, Impulse, Atlantic, Verve, CTI and a few other labels. The list of albums that Van Gelder is associated with is endless. A peek through DG Mono‘s helpful Van Gelder jazz discography up to 1966 – the classic years – has a dizzying effect. To name but a few classic Van Gelder albums: John Coltrane’s A Love Supreme, Sonny Rollins’ Saxophone Colossus, Lee Morgan’s The Sidewinder, Eric Dolphy’s Out To Lunch and Miles Davis’ Walkin’. Van Gelder rarely recorded for Signal. Figures, the label was short-lived and the catalogue was taken over by Savoy in the late fifties. RvG engineered Gigi Gryce, Duke Jordan, Red Rodney… And? ; Blue Note eschewed singers but made an exception for Sheila Jordan. Van Gelder rarely worked with singers – Johnny Hartman for Impulse, Etta Jones for Prestige – but captures Jordan at her spine-shivering best; Van Gelder is synonymous with quintet line-ups, the classic hard bop format. However, his job with swing giant Count Basie turned out pretty swell. Latin Soul is one of the few latin jazz recordings that Van Gelder did for Prestige. Commercial but swinging stuff; African High Life was characteristic West-African dance music, the album’s an odd Blue Note release; Must’ve been somethin’ else for RvG to check in folk singer Dave van Ronk after a few days with the front-liners of Blue Note like Andrew Hill and Grachan Monchur III! However well-prepared, it’s like eating kidney stew after a long-awaited evening at El Bulli. God’s a kind of a less-is-more kind of guy. In fact, the penultimate silence is His trade. Which may be the best music after all. But I know RvG is gonna change that scene.